As a dad, there’s nothing more rewarding than knowing you’re taking great care of your kids. Part of that duty for me is sending my kids Sebastian and Isabella off to school energized and ready for the day. The high-quality protein in eggs provides the mind and body energy they need for long days. My 5-minute breakfast crumble recipe has been a success for me because it’s quick and the kids love the taste! It’s incredible how you can take three simple ingredients and, by changing the way you deliver them, they become something new and exciting. 1. Place two eggs in a small pot and cover with water. Bring to a boil. Turn to just below a simmer. Add the pre-cooked sausage to the water with the eggs and cook both for five minutes. 2. While the eggs are cooking toast two pieces of bread. Cut into cubes (croutons). 3. Remove sausage and chop into pieces. 4. Rinse eggs under cold water. Peel and place in a bowl. Break up eggs with a fork. Stir in chopped sausage and croutons. 5. Spoon into two bowls (or ramekins) and serve! 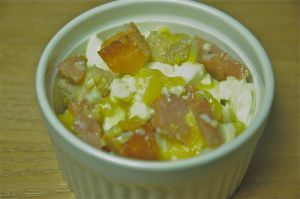 NOTE: You can also prepare the egg-sausage mixture the night before and microwave it until warm. About Jeffrey Saad: Jeffrey Saad was runner-up on season five of “The Next Food Network Star,” and he is a national spokesperson for the Incredible Edible Egg. Jeffrey was formally trained as a chef at the Culinary Institute of America in Hyde Park, New York as well as the California Culinary Academy in San Francisco. He opened three locations of his Sweet Heat Mexican restaurants in San Francisco and is a partner in Pasta Pomodoro Italian restaurants, which has over 30 locations in California. Jeffrey resides in Los Angeles with his wife and two children.